You guys rock. Thank you for keeping us company during the wait at the A&E :) I love you. Still about Neha. The journaling is hers. She wrote it as a caption on one of the photo of the two of them on her facebook account. I'll be lying if I say I didn't tear up when I first read that. I changed nothing, those are her exact words. *sigh* I love my girls. Now they only need to stop growing so much, so fast. Love, love all the stitching and "handmade" touches! ^_^ Hope she's on the mend! Love the page, but you already know that. Gorgeous page. Sorry about the finger- ouch!! Poor girl!!! Sorry about her finger! I hope it gets better fast! I love love love love the lo!!! Such a fun photo and loving the stitching!! Awww. 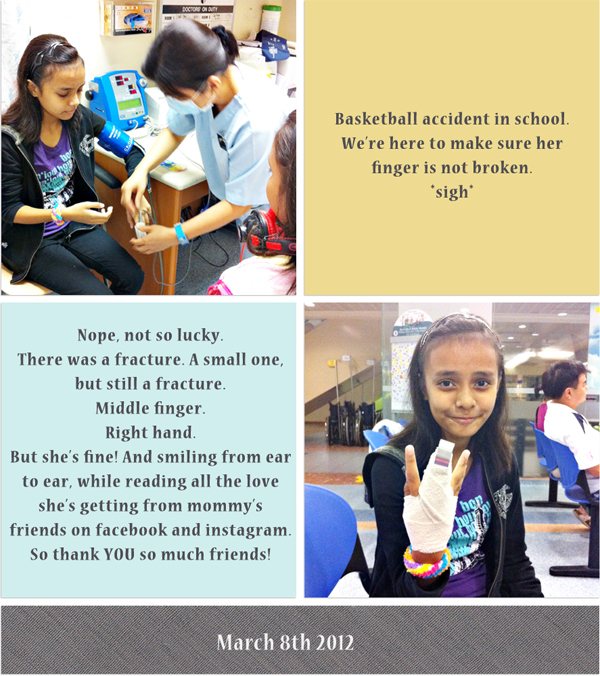 I missed the FB update, but I am hoping her finger heals well and quickly! That LO was my crate fave but I didn't get to read the journaling 'til now... such a sweet girl you have! It says a lot about her, but it says a lot about YOU, too, mama! Owch..broken fingers are not fun! My ds broke his and needed surgery to put it back to together. Hope your dd is feeling okay quickly! I'm so sorry for her! She looks like she's being a trooper though! I hope it heals faster than expected! That page is totally swoon worthy. LOVE the banner - how it;s all built on that big banner piece. And the heart background - perfect as always! OOO fracture! YIKES. I love that the exact words were used for the caption- I can hear her voice speaking as I see the page- lovely pattern and color mix here- your pages are always an inspiration! That is amazing journaling - and I love the photo. I almost teared up myself! lucky not that serious, she will be fine. The LO is absolutely touching (I mean the journal) very nice page. 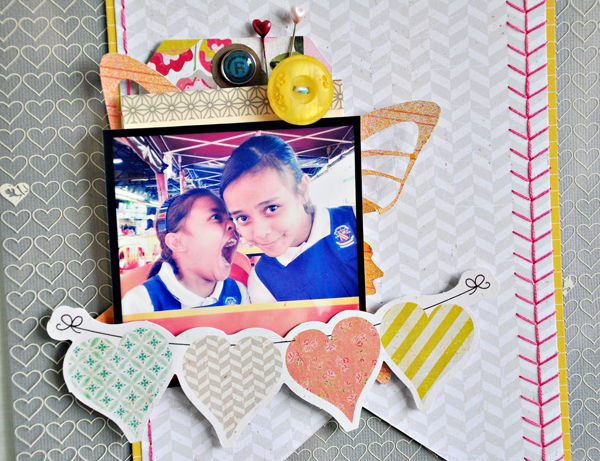 I was wondering the white loves on the grey cardstock is it a Hambly or the cardstock memang got loves printed on it? Those words are precious! Hope the finger heals quickly!! So sorry for dd! Hope her finger heals quickly! what an awesome convo to document! That is just priceless! So sorry about her finger. your layout is really great! I like the hearts. I love your layout. The hand sewing is the perfect finishing touch. The photo comment done by your daughter is awesome. You lucky mom! I'm sending quick healing wishes your daughters way! OH poor sweet girl! Glad she is in good spirits. Page amazing as always! Glad nothing serious happened to her! Hope she will be back to her normal self soon. 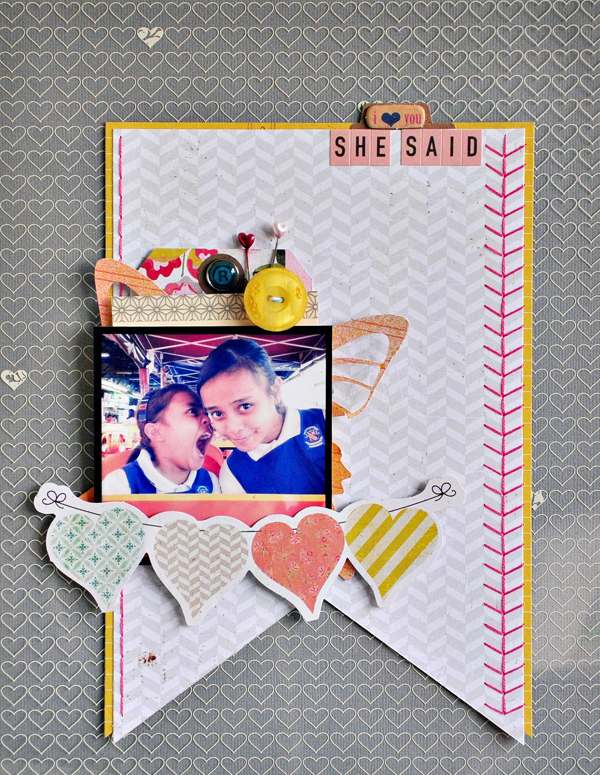 That layout speaks so much of love, such a beautiful journaling too! Bummer on the broken finger- glad she is taking it in stride. Your LO is beautiful!! Your girls are adorable Sasha...just like their Mama:) LOVE this page. You are amazing! Okay that photo is hysterical!!! Such a great moment to scrap, they are going to cry laughing in a few years when they re-discover this layout. Sorry to hear about N's finger :( Hope she's figuring out how to manage. oh I hope it didn't hurt too much! love your crate layout so much Sasha. The journaling made me laugh. cute girls!!! I hope she's feeling better. What she said is PRICELESS!! 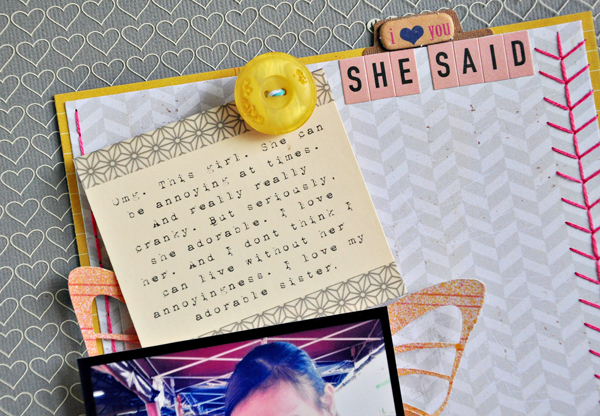 I love how you used it for your journaling on the BEAUTIFUL page! !